Picture driving a flat desert highway little more than fifteen minutes southwest from the Tucson, Arizona airport. You’ve heard about this great new golf course, Sewailo, but where is it? Distant mountain peaks and a painted sky frame the flat land, and if it wasn’t for the ordinary houses here and there, you’d feel as you might as well be on the set for a Western cowboy movie, but there is not much interest or movement to the land and not a desert flower to be found. Perhaps you have taken the wrong turn somewhere. Could there be a magnificent golf course about to unfold? Quite simply, yes! All of a sudden, the large Casino Del Sol Resort building grabs your attention to the left. It looms and rises from the desert floor like a monument in its rural surrounds. This is the home of the richly appointed, highly adorned Sewailo Golf Club – the recreational centerpiece for the Pascua Yaqui Tribe that thoughtfully fashioned this Tucson desert attraction. 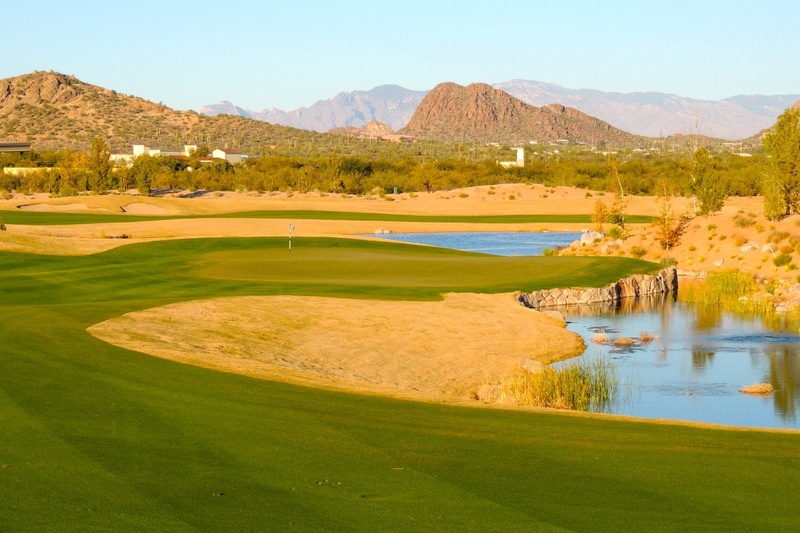 Tucson is one of American golf’s more special “undiscovered destinations.” A city surrounded by mountains exhibiting both a Native American and Mexican influence, it features a variety and even a wealth of wonderful golf courses – maybe even too many for its own good. As American golf play has been declining, it was quite the surprise to learn of the introduction of a new high-end addition to the area’s golf course menu, especially when several other layouts were closing. Be that as it may, golfers are in for a treat at Sewailo – a year round golf experience. Opening in December, 2013, it had been four years since a new course opened in the Tucson area and the lack of colorful vegetation in the immediate area gives way to Sewailo, which means, “flower world.” This is a no-expense spared desert golf transformation of land, flowers, and water. Picture the luxury of transformation that a Donald Trump or Steve Wynn might create for the golfing piece of their casino offerings and you begin to envision the scope of Sewailo. Sewailo is the product of the Pascua Yaqui Tribe and makes for a convenient amenity with which to attract travelers to their adjacent first-class Casino Del Sol. 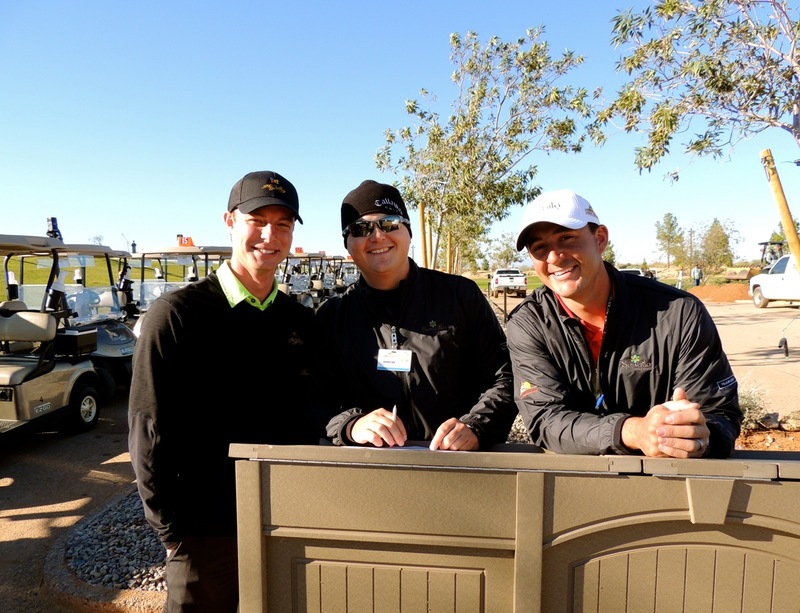 It only made perfect sense that they engage the hottest name in the Native American community, professional golfer Notah Begay III to create their golfing masterpiece. Teaming with golf course architect Ty Butler, Begay is the only full-blooded Native American to compete and win on the PGA TOUR (four times). The two crafted a challenge that adds luster to the already golf-rich Tucson destination. Tiger Woods and Notah Begay. Interestingly, Notah Begay III is more than just another professional golfer or aspiring golf course designer. (Sewailo is his 4th design effort.) He has successfully battled alcohol addiction, but injuries forced an early retirement from the PGA TOUR. More importantly, he has evolved into as a leader and philanthropist for his Native American community. Begay is a Stanford University graduate and a former member of their NCAA Championship Golf Team, and friend and teammate of Tiger Woods (Woods won the NCAA individual title, but never a team championship as he arrived a year afterward.) Begay is also a commentator on NBC television and The Golf Channel. Aware of his opportunities as well as the overbuilding in golf, he shared with me that his work at Sewailo was inspired by trying to build a special enough golf course that it would successfully attract people and also provide employment to the Native American community. The contrast between the expansive Sewailo golf course landscape and the surrounding ones is something to behold. Flowers are central to the Yaqui Tribe’s story of creation, which holds that the deer dancer, “the most central of ceremonial figures in their tradition, emerged from a flower-filled spiritual world of natural beauty. Now Sewailo composes the golfing version of that. Cottonwood, pine, and willow trees dot the course, while some 15,000 native plants were salvaged during construction and even more than that added so as to insure that Sewailo lives up to its name. Purple sage, yellow brittlebush, and pink and white roses make up some of the stunning parkland palette. Next came the complete transformation of the rather once drab, flat 200-acre golf course property. Said architect Ty Butler, “That was no small feat considering the flatness of the land. We had to work that dirt to death” to create enough elevation and depth to create lakes, streams, mounding, and hazards so as to provide a visual interest and golfing challenge. Massive amounts of earth were moved whereby areas would be dug out to provide water hazards and depressions and the fill would then be moved to create mounding and elevations; so much so that Sewailo evokes comparisons to Steve Wynn and Tom Fazio’s Shadow Creek Golf Club in Las Vegas. 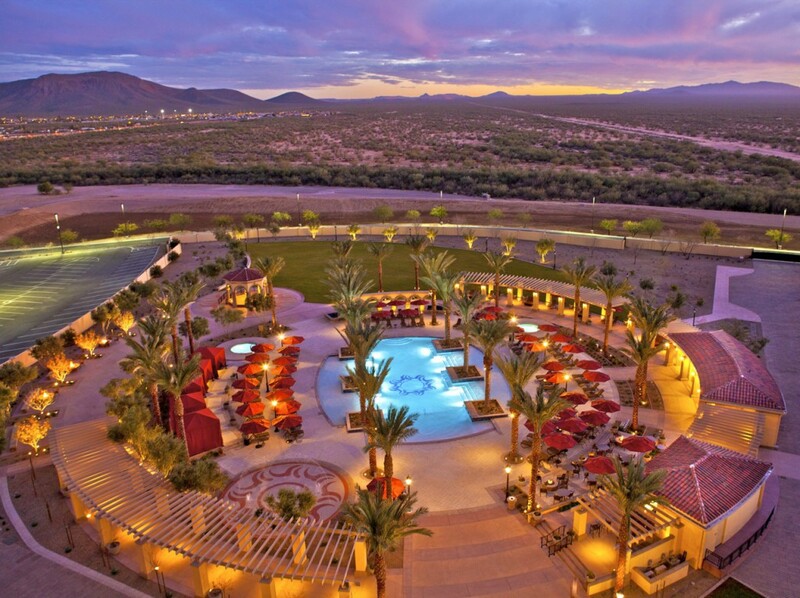 The Casino Del Sol Resort spells fashion and comfort in the Pascua Yaqui Tribe style. As for water, Sewailo is on a par with what Donald Trump might create with his golf courses – water falls, streams, and lakes. Tribal rights access to an immense 325 million gallons of water per year—four to five times that of the average Arizona course—helped Begay and Butler create a botanical water attraction guaranteed to seduce parched desert golfers as well as sophisticated world travelers to this newly created golf oasis. Begay and Butler moved an immense amount of dirt from the flat site to create a sort of mounded, flowered desert oasis. As is often the case, water hazards were dug out of the desert and the fill created the modern mounding providing the visual relief that makes the challenge anything but dull. Water affects play on 11 holes and includes 14 acres on seven lakes, and a mile of streams! As far as the golf is concerned, it’s exciting! Set upon such an impressive canvas of beauty with the mountain backdrops, desert vistas, water, flowers, and spacious ribbons of green, the challenge is one of both attack and retreat, punishment and reward. I particularly liked the versatility and playability of Sewailo. Five sets of tees can make for a layout that can accommodate either today’s long-hitting professionals stretching to 7,282 yards (or beyond 7,400 if necessary) or conversely novice vacation golfers at only 5,209. On many tee shots, Begay and Butler encourage you to wallop your biggest hit and cut off doglegs or bunkers while on others he forces you to play cautiously. It is the addition of desert, fairway and greenside bunkering, or water hazards placed in or around the wide landing areas which forces one to constantly access the risk-and-reward possibilities. Many of the landing areas are quite generous inviting bold tees shots, but miss them and you’d better be prepared to pay the price. The bentgrass putting surfaces are large and undulating, with the one housing both the 1st and 8th holes being about 23,000 square feet! The designers continue their artistic shaping with boldly bunkered and sweeping surrounds for their greensites. Sewailo is the home course for the University of Arizona golf team where even the collegians will be tested by the slope rating of 138/73.5. The conditioning is immaculate. Trying to pick a favorite hole at Sewailo is almost as challenging as playing there. I might have to agree with Notah Begay who says his favorite hole may be the shortest, the 155-yard 3rd with a lake in front of the putting surface and feels for him like the 12th at Augusta National. The 638-yard double-dogleg 10th is a hole you’ll either love or hate. Featuring a lake, deep fairway bunkers, and then a stream, it starts with what many will hit as a lay-up off the tee, and then requires two more very good, strong shots uphill to reach the putting surface. I also found the finish at the par-4 17th and 18th quite exciting as it brings water into play right to the finish. Perhaps the best part is that is that the supporting cast of holes is varied and exciting as well with a nice pace and flow! Moments after I snapped this picture of the par-three third hole, one of my buddies hit the closest-to-the-hole sign just to the right of the flagstick. His ball hit it so squarely that it bounded all the way back into the water! Needless to say, much laughter followed. Poor guy… (Photo by Robert S. Fagan) Below is a view from behind the 3rd green back toward the tee. 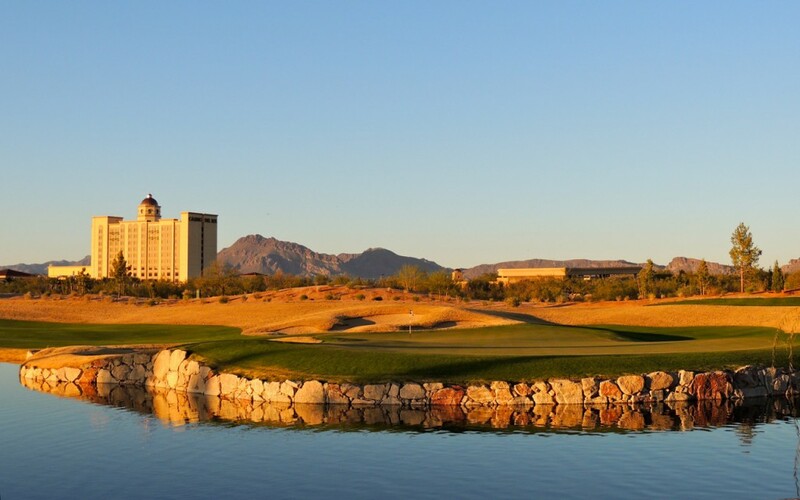 As mentioned, Sewailo is part of the adjacent Casino Del Sol Resort – a fact that makes up the other great reason to visit Tucson and play golf here. The imposing and luxurious 215-room casino hotel can be seen from every hole on the Sewailo course and is only a short limo ride away. With the gambling and golf, the comparisons to Las Vegas are many. The Tuscan-themed gaming and restaurant court evokes memories of Caesar’s Palace while some describe the hotel’s sumptuous elite suites as “Baby Venetian.” You can sun at the vibrant pool scene adorned with palm trees or take in a star entertainer such as Toby Keith, Gwen Stefani, Pitbul, Van Halen, or Heart at the 4,000-seat amphitheater. Your palette will savor the urbane P.Y. Steakhouse, enjoy mouth-watering sushi rolls at Mr. An’s, or partake in an international buffet that rivals the quality of anything on the Las Vegas Strip for a fraction of the price. The view inside the Casino Del Sol Resort is reminiscent of that at Caesar’s Palace in Las Vegas. 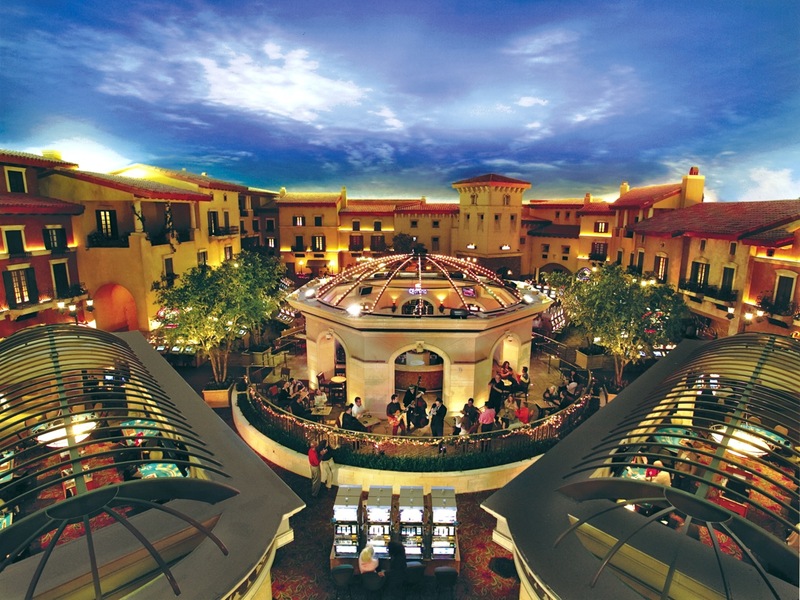 Casino Del Sol, by the way, has already earned AAA’s four-diamond rating and a Four-Star designation from Forbes. You can enjoy its six bars and restaurants, two casinos filled with one-armed bandits and table games, the Hiapsi Spa, the Oasis pool and bar, a state-of-the-art conference center, and outdoor amphitheater – really world-class amenities. Just as important as the amenities is the excellent service you experience at both the Sewailo Golf Club and the Resort. You will discover the majority of employees to be the Tribe Members and their appreciation for what they have to offer really translates into their excellent service. Rates to play Sewailo are dynamic, but typically range from $29 to $150 and there are some specials that include rental sets or a free putter with the green fee price. 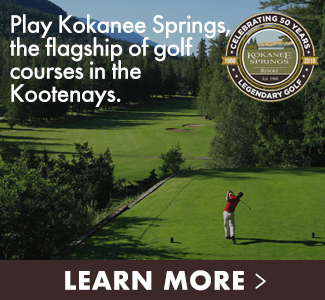 The facility closely coordinates specials with the Resort and this includes group and charitable play. For further details, refer to: www.sewailogolfclub.com. The view of the pool at the Casino Del Sol Resort beckons me down after a day on the engaging Sewailo Golf Club course! 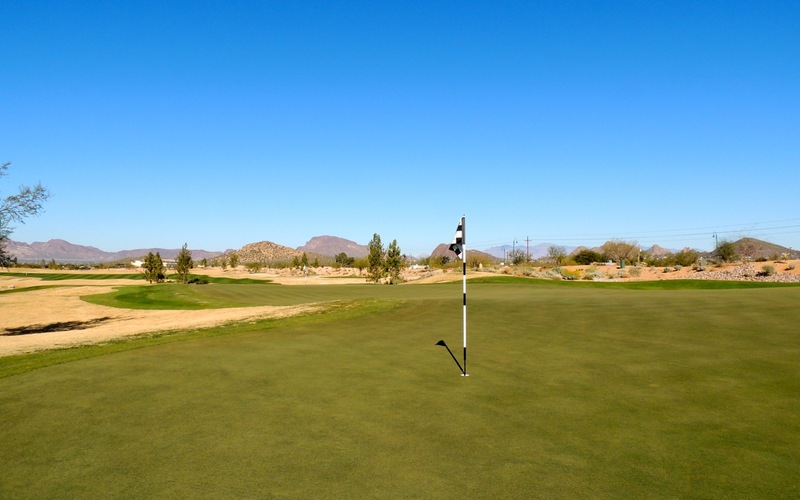 While it makes perfect sense to play and stay at Sewailo and the Casino Del Sol Resort, this location can also be a great spot to explore the rest of the Tucson area. This area is complete with wonderful Southwestern art, history, shopping, cultural, and outdoor adventures all-year long. 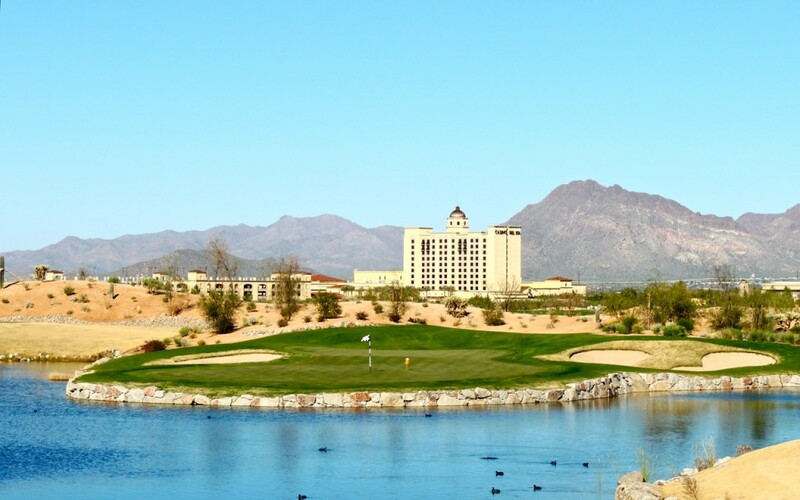 The Sewailo Golf Club, Casino Del Resort, and Tucson have so much to offer. Yes, these high desert offerings will evoke many comparisons to Las Vegas, but they may be even better! Precious few Las Vegas golf courses will compare to Sewailo. 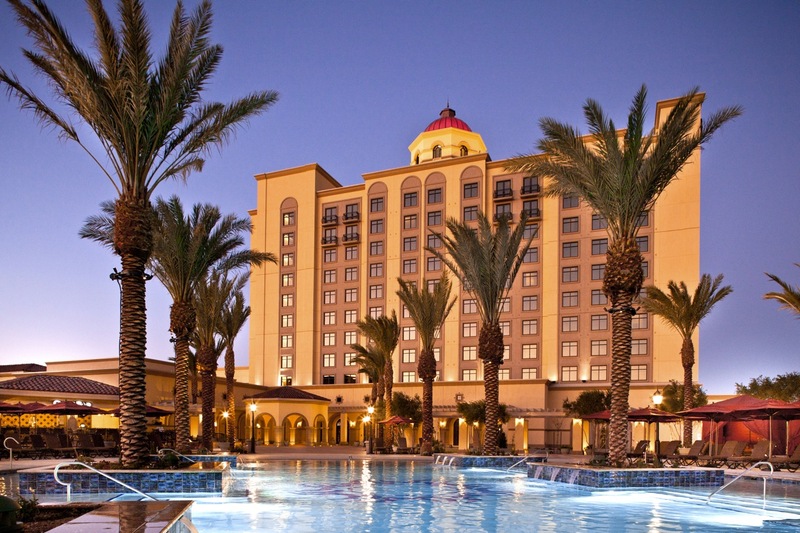 The Casino Del Resort is easily accessed with world-class amenities and service, yet it is peaceful and quiet, and Tucson has a unique culture and ambiance that Las Vegas cannot approach. All provide a very good value. Worth the trip? Absolutely! Below is the wonderfully artful bunkering that adorns the par-four 18th green at Sewailo.